Not only is the C.L.A.W great for kids, but it can be used to give disabled adults the power to write, and eat on their own. It helps students with special needs to write with comfort and confidence. It helps with hand ailments caused by low muscle movement from Parkinson's disease, Autism, Arthritis, and in stroke victims. In fact, it is great for anyone who is tired of getting hand cramps from writing. The same C.L.A.W can go from side walk chalk to crayon instantly. The C.L.A.W is available in three sizes covering ages two years through 1st grade, 2nd grade through 6th grade, and 7th grade through adults. The Writing C.L.A.W is made of flexible material that forms to your finger. 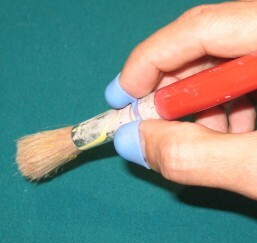 This pencil grip will quickly eliminate thumb wrap and fist grip and create a true tripod grip. It fits both left and right handed users. The C.L.A.W is latex free and meets all the new lead and children safety requirements.